José Gutiérrez, who earned a bachelor’s degree from the MU Trulaske College of Business in 1984, will receive the 60th annual Distinguished Service Award, the highest honor presented to an alumnus by the MAA. COLUMBIA, Mo. – The Mizzou Alumni Association (MAA) will honor 12 outstanding faculty and alumni at its 48th annual Faculty-Alumni Awards Ceremony on Oct. 2 in the Reynolds Alumni Center. The Distinguished Service Award, Distinguished Faculty Award and 10 Faculty-Alumni Awards will be presented to outstanding MU faculty and alumni. José Gutiérrez, who earned a bachelor’s degree from the MU Trulaske College of Business in 1984, will receive the 60th annual Distinguished Service Award, the highest honor presented to an alumnus by the MAA. Established in 1956, the award recognizes outstanding service by an individual whose efforts have added to MU’s excellence. Gutiérrez came to Mizzou in 1982 from Madrid, Spain, with only a working knowledge of English. Since then, he has proven himself as an international business leader, serving AT&T in a number of roles. In his current position, he serves as the senior executive vice president of executive operations at AT&T Services, Inc. Previously, he served as president and CEO of AT&T Advertising Solutions, president of AT&T Global Enterprise Solutions, president and CEO of AT&T Southwest (also known as Southwestern Bell), and president of industry markets. In 2013, Gutiérrez was named one of the top 100 global telecommunication executives. Gutiérrez also has played a significant role at Mizzou, holding leadership positions in multiple organizations at the university. He serves as vice-chairman of the Thompson Foundation for Autism and Neurodevelopmental Disorders and is tri-chair of the Mizzou: Our Time to Lead comprehensive fundraising campaign. In addition, Gutiérrez is a member of the Strategic Development Board for the Trulaske College of Business and the Missouri 100 Advisory Board. He also is a Jefferson Club Distinguished Fellow, Davenport Society Benefactor and a Chancellor Society Member. For his accomplishments, he was the 2008 recipient of Faculty-Alumni Award from the Mizzou Alumni Association. Barbara Reys, Curators’ Professor and Lois Knowles Faculty Fellow, will be honored with the 56th annual Distinguished Faculty Award, the highest honor presented to a faculty member by the MAA. Established in 1960, the award recognizes a faculty member whose sustained efforts in teaching, research and service have added to MU’s excellence. The award places special emphasis on the recipient’s relationships with students. Reys, who has served Mizzou for more than 30 years, has been instrumental in establishing the university as a major research center for mathematics education and one of the premier doctoral programs in the country. Over her career, she has directed multiple National Science Foundation grants, totaling $30 million, which ultimately have led to Mizzou’s recognition as one of the top 10 doctoral programs in mathematics in the nation. Her research has yielded seven books for practicing teachers, 21 book chapters and more than 120 peer-reviewed journal articles. In 2006 she wrote and edited the book, The Intended Mathematics Curriculum as Represented in State-Level Curriculum Standards: Consensus or Confusion?, which was instrumental in the development of the Common Core State Standards for Mathematics. Throughout her career, Reys has served as president of the Association of Mathematics Teacher Educators from 2009-2011, board member for the National Council of Teachers of Mathematics from 2001-2004 and founder and co-director of the national Service, Teaching, and Research (STaR) Program for early career mathematics educators from 2010-2015. For her accomplishments, she was named Missouri Outstanding Post-Secondary Mathematics Educator by the Missouri Council of Teachers of Mathematics in 2004 and the Judith Jacob’s Lecturer by the Association of Mathematics Teacher Educators in 2014. At Mizzou, she is a Jefferson Club Diplomat, MU Legacy Society member, as well as a Grace Bibb Society Diplomat and Founder. For her service to the university, she was a 2004 recipient of the Mizzou Alumni Association’s Faculty-Alumni Award. James A. Birchler, Curators’ Professor of Biological Sciences (faculty member). Jacqueline Kay McEntire Clark, director of communications and public affairs for Ash Grove Cement Company (alumna). Don M. Downing, attorney and partner at Gray, Ritter & Graham, P.C. (alumnus). Deborah L. Hanuscin, associate professor of science education and physics (faculty member). Gary L. Link, special assistant to the MU director of athletics (alumnus). Stephen J. Owens, General Counsel, University of Missouri System (alumnus). Howard G. Richards, Jr., senior manager of external relations in the College of Arts and Science (alumnus). Marjorie R. Sable, professor and director in the School of Social Work (faculty member). Jolene Marra Schulz, educator and co-owner of Tiger Trolley Tours (alumna). Nancy M. West, professor of English (faculty member). The Mizzou Alumni Association (MAA) strengthens MU by supporting the best interests and traditions of Missouri’s flagship university. 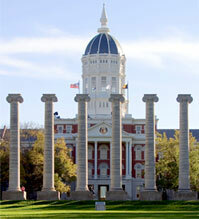 MU is the state’s largest and oldest university and the state’s major public, land-grant research institution. The MAA, the voice for nearly 300,000 MU alumni worldwide, keeps alumni connected to each other and their alma mater. Since 1853, the MAA has influenced generations of students and alumni by preserving their traditions. The MAA Faculty-Alumni Awards celebrate outstanding faculty and alumni who work to advance the arts, sciences and humanities. At Mizzou, scholarship and teaching are driven by a responsibility to public service—the obligation to produce and disseminate knowledge that will improve the quality of life in the state, the nation and the world.